My biggest fear is to drown and die in the ocean. It is not a secret that I’m a little bit paranoid with ocean. I love beach, but well not so crazy about ocean. Actually if I wanted to go psycho-Freud myself it might have started when I was about 7 years old; when I was still carefree and dared to do anything. My mom brought me and my brother to our relative’s apartment that apparently had pool. When my mom did something with our bags, me and my brother ran like crazy and… SPLASH!!! I just jumped in to the 2 meters pool. Oh yeah, I couldn’t swim FYI. I drowned. And I swear I thought I was dead. Thank god my brother saved me. Yeah I probably owed him a life. Long story short, I never went to the pool again since then… Until I had to take my final PE grade on my high school and it included swimming. Of course I didn’t pass. And I didn’t care anyway. I just wanted the day to end as soon as possible. Being in a swimming pool brought back bad memory and it made me nauseous. Anyway, the other four of my family member could swim. My mom was a swimming athlete, not the very professional though but she’s really REALLY good. My brother is almost as good as her. Then it was the adoption thing all over again. Swimming really depressed me. Then long story short (again) I was very into exercising about three years ago. I was a freelancer teacher back then and I had so much free time. I went to gym every day (seriously, everyday) with my cousin. We did yoga, weight training, running, and that combat fiesta. Both of us couldn’t swim and we felt very bad that almost everyday we passed this opportunity to skip this gorgeous big swimming pool. See below photo of how gorgeous the swimming pool is. Bringing my niece to the ‘private’ pool in a beautiful Saturday morning. I didn’t know what had gotten into us, we started to learn how to swim, ALONE! Yeah! It was probably because the whole swimming pool was only 1,6 meters deep so we felt secured and safe. And the weirdest thing was, WE FINALLY LEARNED HOW TO SWIM. Funny huh? However I never dared to swim in a 2 meters deep swimming pool, because even though I could swim already, I always thought I couldn’t float. So if there was anything bad, I would totally drown. Three months after that, I went on a snorkeling trip in Phuket and guess what, I was swimming in the ocean. For about 30 seconds only, but hell I did that! Hahaha. I don’t know why I always start to panic everytime I’m near deep water. I freak out and I forget to breathe. In my inner circle, I have always been the coward one. That’s the reason why I didn’t kayak, I didn’t scuba dive or do any activity with possibility of drowning or being trapped inside the water. Lately, I go to the public pool alone every Monday and Thursday. The public pool is the typical Olympic pool where it is only shallow in both end of the pool while it is 2 meters plus deep in the middle. However I always swim in the side of the pool so if anything went wrong, I would grab the edge. Yesterday I went to my regular swim and found out that the side lap was used by a group of kids who were doing some PE test. 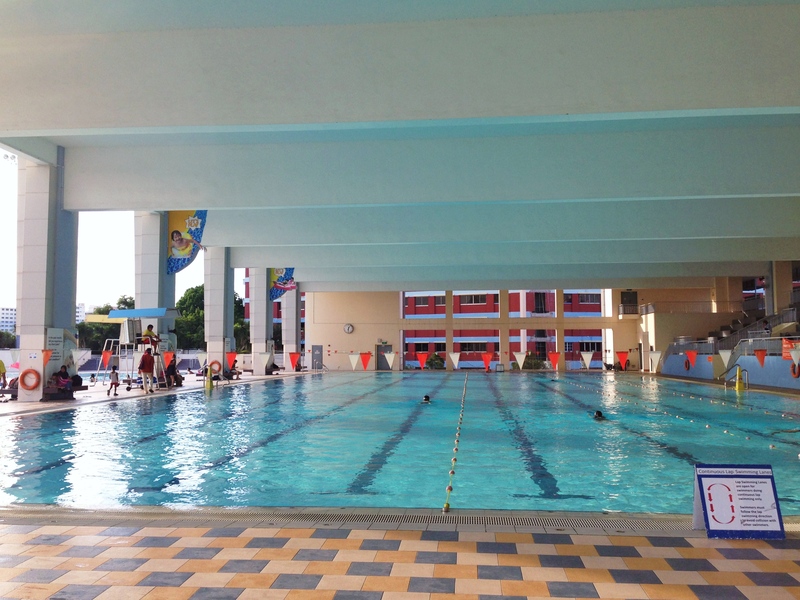 The other side of the pool is used only for advanced continuous swimmer. So the only option left is… TO SWIM IN THE MIDDLE. I stretched, soaked in, took a deep breath and started to swim… until about 3 meters and then I stopped. I panicked and I forgot to breathe. I swam back to the edge and almost cried. Why am I still afraid of deep water? Why do I have to be that coward?! Geez, May, you can swim and you can float for god’s sake just go ahead!!! Fear and panic are two separate feeling. Fear is healthy, panic is deadly. I do logically know that I can swim and I have been practicing a lot. Now, what I need to do is NOT PANICKING. Face my fear and don’t panic! Very easy literally huh? I took a couple of minutes to think and consider… then I took that push. And I swam… away to the middle of the pool. I kept telling myself “calm down May… you can do this. Calm down… Don’t panic…” over and over again until I saw a red tile below me on the bottom of the pool that meant I had reached the deepest point. I had overcome my fear and thrown away the panic. I was swimming, in the middle, ALONE. It was awesome. The feeling of doing something you used to be very afraid of is very VERY awesome. Indeed it is true that fear is healthy. Fear has given you a reason to be brave. You will not be a brave person unless you do something you’re afraid of. And being brave makes you feel powerful. Panic, on the other hand, is deadly. Period. May, not really the coward one anymore. This entry was posted in Growing up, The Sanguinism of the Journal and tagged brave, chasing maverick, fear, overcome fear, panic, swimming, swimming pool. Bookmark the permalink. ← To yell back or not to yell back, that’s the question. First of all suffering from phobia has nothing to do with cowardice. Facing them and overcoming them is ( very) brave though. Not an moral obligation, but just sheer personal bravery in my opinion. It’s worth the effort indeed. Perhaps it doesn’t go for Uruguay, Central Republic in Africa or Czech, but in every country abundant with lakes, rivers, canals and sea everybody should learn how to swim for his or her safety. By the way I think it’s pretty smart though to have second thoughts before swimming in the ocean. Direction of winds, currents and even more under-currents are risks. hola halo .. ikutan mo kasih selamat nih! Good job May!!! You really do a good job!! FYI, next time, kalo lo panik pas ada di lane tengah, lo bisa grab pemisahnya itu, pelampung-pelampungnya itu. They’re strong enough to keep you floating :). Kalo mau uji nyali, ntar sore pas lo kesana lo berenti di tengah, terus coba pegang!! Gue selalu bertanya2 apa si pelampung nya cukup kuat nahan gue floating??? Lo udah pernah blom di? Gue mikirin maw nyoba aja udah panic nih, tiba2 jantung gue deg2an abisss!!! Anyway what’s wrong with mousharilla blog?